There are no words to express how infinitely sorry we feel that the kind, smart, handsome, young man that you were did not get to experience your full potential on this planet. There are no words to express how we enjoy looking back at the fun times we shared and how we look forward to the moments when you still make us smile. There are no words to express how much we would appreciate to hear your opinion on the craziness of today's world. There are no words to express how much you have not been forgotten. There are no words. Just thoughts. And hugs. These days, we're sending you and your wonderful parents an extra load of those. Another Summer, Fall, Winter, and Spring - another Year. … 4,019 days, 574 weeks, 96,456 hours. To quote “ Remembering you is easy, we do it everyday. Missing you is heartache that never goes away. “ Time doesn’t ease the emptiness, doesn’t ease the pain. Cherished memories never fade. In your all-too short life, you lit up every corner of our lives and gave us tremendous joy. You left behind daily reminders and touchstones, so many proud moments, love and delight. For those who knew and loved you, you left a huge void. You remain with us each and every day, in everything we do. We will miss you always. How can it be that time again, July, when you were so suddenly taken from us. How can it be? As your Mom pointed out in June, it has been 11 years now, half your age in the years you spent making your indelible mark on life and hearts. I will never forget, and I remain heavy with sorrow, but anger too has now crept in. Anger because the world needs now more than ever, the fine mind, soulfulness and steadfast belief you had that one can make a difference The world is a much different place now, and one that has gotten madder with each moment. Bright, guiding lights such as you are so deeply needed to effect change, and counter the cynicism that has set in, and yes even in me. If there is a parallel universe Michael, and you are looking upon us, have mercy, and send back some of the love that we have and will always feel for you. It’s been 11 years since we celebrated your birthday together — half of the too short 22 years which you, we and all those who loved and respected you enjoyed. Who, and where would you be today at 33 years of age? We wish you were with us and we miss and love you. You are always in our hearts and minds and we cherish beautiful memories. Michael, Ten years have past since that dreadful day we learned you had left us. We think of you so very often, usually with a smile or a "what if?"... but this time of year our thoughts are filled with sorrow. There are no words to express how sorry we feel that your time in this world had to be so short. How wonderful it would have been to share and joke on our respective "adult" experiences. Instead, we enjoy the fun memories of our childhood adventures. We keep them close and often relive them in our conversations. Thank you so much for those! As we loved you, so we miss you. Ten years have passed, a decade of trying to find the right words. There are none which fully express our pride in you and our sorrow in losing you. In real time, we know it’s been ten years. Yet, many days it feels like yesterday. We still expect you to walk through the door, to phone from faraway places, to send us emails or texts. We still expect to be greeted by your infectious smile, dancing eyes and big bear hug. We long to hear your voice. Tousle your thick wavy hair. Hear of your exploits, adventures, hopes and achievements. Then, reality sets in. We’ve missed you now for 521 weeks, 3,652 days, 87,658 hours, 5,259,487 minutes, and 315,569,259 seconds. Ten years of your and our wishes, dreams, hopes all scattered and unfulfilled. We long to have you back in our life. But, not to be. Instead, we hold you close in our thoughts and forever in our hearts. Loved, remembered and longed for always. Remembering you and your fine son, Michael, on the 10th anniversary of his passing. Dear Michael ..... Happy Birthday! June 22, 1985 was our happiest day — you entered our lives and changed us forever. Today is your birthday — you would have been 32 years old — no doubt, with a family, aspirations, dreams and accomplishments. How we wish you were here to celebrate with us. But ... instead you live on in our memory and hearts, on a 24/7 basis daily. Photo frames throughout our home recall your childhood, your teens, college and brief adulthood — memories of neighborhood, family and college friends, travels, good times and special celebrations punctuate our lives on a daily basis. We’re surrounded by your beautiful smile, sparkling eyes and enthusiasm for life . Friends and family hold you close, remember you always. We miss you, terribly. Well it is that time of year again, of your graduation, birthday and ultimately the deep sorrow of your loss, forever. It has been 10 years. How can that be? Ten birthdays; 10 winters; 10 summers; 10 falls and 10 springs. A decade. There are too many ways to say the time stolen from you, from your mom and dad and all of us in not having you here. Usually I am not at a loss for words, and often teased as such. But I have no words this year, as it remains incomprehensible that 10 in this context even has to be spoken. Incomprehensible and unrelenting sorrow. Hey Michael, Thinking of you often. Regretting we didn't have the opportunity to know you more in our adult years, but hanging on to our childhood memories. Hoping for the best for the US this November, wishing we could hear your impressions and learn from your passion for politcs. In the bittersweet radiance of summer we remember you, Paul and Vesna, and your son, Michael, who accomplished much in many ways during his lifetime. May your memories give you love and hope. Nine years. Nine years of missing him — daily, hourly, minute-by-minute. Nine years of wondering who he would have become, what he would be doing, achieving, experiencing. And, where, with whom? Where would life have taken him? Michael is always on our mind. We see constant reminders of him: his favorite numbers on alarm clocks, license plates, digital phones and cameras; children with the same build, expressions and bright-lit eyes; situations and things that would have made him laugh; sports, games and discussions that were among his interests. Michael had a zeal for life which embodied a keen interest in and fascination for all things international — be it travel, culture, gastronomy or politics. We can only imagine his take on this year’s US election. We miss his spirited political arguments and can picture him regaling against Trump, arguing for reason and sanity to prevail. We can picture his disdain for the state of world affairs today. We can picture him somewhere, far beyond North America, pursuing academic and professional goals. Or, maybe he would he have stayed in New York pursuing a financial, international relations, legal career? We miss visiting his apartment, meeting up with him and his girlfriend. We do know that had he lived, we’d be seeing him often returning to Toronto to visit family and far-flung destinations to visit his friends or just chilling in Hilton Head — in his favorite big yellow armchair, on the beach, a bike trail or on the tennis courts. He loved to read, relax, take in the big blue sky and sea air. We used to and still refer to expansive clear weather days as “Michael J” blue skies. So many visuals and so many lost moments with him haunt us daily. And, there are so many everyday, trivial happenings we and he no longer get to enjoy. Most of all, we miss his beautiful smile, his curly thick hair, his handsome athletic persona, his warmth, affection and spontaneous hugs. We miss his stubbornness, his teasing, his wit and wonderful humor. We miss his caring and nurturing nature and his inquisitiveness and love of life and people. To us, he was one-of-a-kind. We miss him terribly. Happy birthday, dear friend. Thinking of you on this day, just like every other day. Miss you so much, especially miss that unmatched wit, warm smile and big bear like hugs. Can never find the right words to give you proper justice. You would have undoubtably accomplished so much by this birthday. I'm so grateful for my four short years with you...only the greatest people leave that much of an impression in such a short timespan. Love you. This time of year always brings a rush of emotions, wonderful memories (and very sad ones too) as you are remembered and celebrated via your annual GU and UCC tributes. You touched so many in such a very, too short, time. We remain in contact with many of your closest friends, who individually continue to comment on your wit, sincerity and support. Most have moved forward with spouses, houses, and, in some cases, children. All have pursued very successful careers. But, none have forgotten the impact you had on them. We so wish you were still here with all of us to celebrate what would have been your 31st birthday. You are in our heart and mind always, in everything we do, everywhere we go. Our memories keep us going and we remain so proud of you and your legacy. We miss you, always. I have been thinking of Michael a lot lately. Every few years, when Lecture Fund finds itself with a controversial event, we go back to past events where things were handled well. One of these was an event Michael planned with the Minutemen. It was highly sensitive, and he handled the controversy so beautifully - with patience and evenness toward all vested groups, a sense of calm that helped set the tone for the event, and a true fearlessness in the face of anger, vitriol and calls for censorship. He really did not shy away from the difficult moments. It’s a quality I think is passed down to current generations of students through this lecture. There’s a thread of emails between students and GULF (Georgetown University Lecture Fund) alumni going on right now about tonight’s lecture, and the warmth of feeling about Michael as a friend, as a leader, as a fellow Hoya live on in so many people. We all miss him. Every year we try to find the right words. For you. And for your wonderful parents. But there are no words. There are just memories. Memories of fun times with an amazing person. You are and will always be remembered. What’s left to say that hasn’t already been said and repeated these past 8 years? You were denied. We were denied - of all your potential life achievements and milestones by a freak lightning strike. In a split second, we lost you and nothing has or will ever be the same. There are no words that approach to describe our sadness, anger, grief. But, your memory lives on; your smile still shines; we feel your warmth; your love of life inspires; your passion, curiosity and quiet leadership are very much missed; and, we are so proud of what you achieved in your too-short 22 years. We cherish that best period of our lives and nothing will ever take that away from us. Words cannot express our monumental loss and love. You live in our hearts, forever. Happy birthday Mike! I can't believe you would have been 30 today. It feels like just yesterday we celebrated 21st birthdays. I miss your smile, jokes, and sarcasm but am so lucky to have the best memories of you. I wish you could have met Avery. I think you would have gotten a kick out of her. Thank you for looking down on us every day. Love and miss you today and every day. Today you would have turned 30 -- would you be married? have children? where would you have put down roots? would you have a job satisfying your interest in International Relations? or be practicing Law? We have so many questions ... and, these are just a few of life’s precious happenings denied to you and to us. We will never know why? Our only solace is that you lived a good and full life in your short 22 years -- you gave us so much pride, love and beautiful memories all of which we hold very dear. To the world you were one person; but to us, you were the world. We miss you 24/7 ... you are in our hearts and minds forever. We miss the love, laughter and warmth you brought to our lives daily. Remembering the special moments, your "Oh Baby!" exclamations, the joy of sharing past happy holiday times. We wish we could hook up, remember crazy times at your cottage and in Switzerland, share future plans and talk about the world. So often we think of you. Know that you are missed. Remembering Michael Jurist and remembering you, Paul and Vesna, in our thoughts and prayers, Anna. It’s been seven years and yet it feels like yesterday. We are still numb and in disbelief that you’re gone. Your face, smile, voice are still sharp in our minds; memories of 22 beautiful years with you are ever-present; your warmth, humor, intellect and love of life is juxtaposed with our constant “why”? We have no answers. All we have is our constant love and remembrance for you. You continue to make us proud. Each day brings a memory, a smile and a tear. That will never change. Happy birthday Mike. I'm thinking of you today, like every other day. I know you're looking down, watching out for us and watching some World Cup. Miss you every day. Today would have been your 29th birthday ,,, where would you be? What would you be doing? You had so many aspirations, so many plans, deserved so many achievements and celebrations. Instead, we mourn your loss. We’ve moved from our family home taking with us a multitude of cherished memories, keepsakes and photos of your far too short life. Each and every momento, carefully hoarded by you, speaks volumes of your childhood through adulthood ... travels (family and independent) ... your athletic, political and social interests ... your love of learning ... your wide circle of friends from all parts of the world. You gave us the best of life. You touched so many, so deeply. You are and will forever be missed. Never forgotten. We carry you in our hearts and minds each every day and cherish the day you were born. It is that time of year again.. milestones such as your graduation, your birthday this week (June 22) and of course the worst of all possible days when we lost you. This year brought another milestone, that of your parents moving from your family home. On my last visit there, going into your bedroom, seeing your memories all around, and photos that chronicled your life was so difficult, not easier with the passage of time. A colleague lost someone suddenly a few months ago and called me in her sadnesss, and one of her comments 'It is so final' hit me like a tonne of bricks.. I think that is the conscious thought that I have been avoiding all along. When I think of you so often the sorrow and sadness is unavoidable.. However, I speak your name often, to family, friends and now my young nephews telling them about your outstanding qualities and grace of spirit as an example to aspire to and live by. You, Michael will never be forgotton. Hey, Mike - I'm finally wrapping up my law school exams - my last exams ever. Can't help but think about how good you would have done in law school. Thinking of you today and always - we miss you! We just attended your annual Georgetown University “Duel in the District” Tennis Tournament and Lecture Fund event in Washington, DC this April and continue to be amazed and moved by the tributes paid in your memory. Your earlier GU involvement in both Club Tennis and Lecture Fund and all-round “nice guy” achiever reputation are widely recognized, still motivating students who didn’t even know you to honor your memory. Missed our lazy Christmas morning coffee, eggnog and "Whoa Baby" exclamations this and every holiday season without you. This is the second time in the year that you are closer in my mind... Thanksgiving... that last year when you, your Mom and Dad took a quick day trip at your urging as you hadn't seen the county where I had moved... we sat out on a high hill overlooking Lake Ontario's warm brilliant sunshine under what we call an MJ blue sky. You are always near, but more so at certain moments in the year, and you stay close to light my way. Thank you Paul and Vesna for the wonderful poster. I will frame it when I get a chance. I had fun at the tennis tournament despite my poor showing. Dear Vesna and Paul, I never had the privilege of meeting Michael; I am simply a stranger and fellow parent from British Columbia, writing to say how moved I was by your heartfelt tribute to your marvelous son, which I read in today's Globe and Mail. Reading your words of love and sadness, I felt compelled to stop what I was doing for a few minutes and reflect on the precarious joy and meaning our children bring to our lives. I do so much hope you are drawing some solace from the wonderful memories he created for you and others. He had an easy smile, a warm and friendly energy and was a person who did random acts of kindness everyday of his life. Friends, schoolmates, teachers, staff and perfect strangers; it didn't matter what your relationship was to Mike, you were the recipient of something positive from Mike and often something meaningful. I miss you Mike, and I continue to try to apply the lessons that you have taught me during our years together at UCC. Although I may never get there, I still strive to live the motto "Be like Mike." You were a bright, shining light -- kind, talented and generous. We will always miss your humor, warmth, incredibly handsome smile and enthusiasm for life. And, always remember your passion, curiosity and quiet leadership as we strive to keep your legacy strong. How we wish we could see who you'd be today, laugh at your exploits and cheer your successes. Words cannot express our love for you and the monumental loss and sorrow we feel each and every day. You are deeply missed, always remembered and forever loved. On June 22, 1985 you came into our world making us proud and ecstatic parents. You then gave us 8,073 days -- exactly 22 years, one month and 8 days of love, purpose, pride and joy! Words cannot begin to express our love for you or the monumental loss and sorrow we feel each and every day. You were a bright shining light in our lives -- kind, talented, generous and accomplished. You would have made the world a better place and are deeply missed by friends and family. Big hug, from one basketball nut to another. Miss you Mike! You're always in my thoughts and prayers. I can only imagine the discussions and the guffaws we would be having trying to digest today's extreme US political platform! We miss your sharp, political mind. If we take a second and look around the auditorium, the quality and the quantity of individuals here this evening, in and of itself, stands as a more eloquent testimony than words to Michael's shining spirit and the meaningful way in which he touched our lives. He, like all of us, is a product of nature and nurture, both of which are a direct tribute to his parents. By way of nature, Vesna and Paul gave Michael great genes. Through nurturing they gave unconditional love, balanced with a steady hand that ensured he never lose sight of what was - and was not. In speaking of Michael the word special comes up time and again among everyone. What makes someone special, sets them apart. Besides finding so many outstanding qualities in just one young man, I believe Michael was granted a grace of spirit that set him apart. A rare quality to find in people, though as a society we give it lip service. It is the essential quality that maintains our humanity - it is the quality of kindness and Michael had it true and pure to the core of his being. Perhaps this grace was the plumb line that kept him centred, and fed the calm steadfastness that drew people to him. Made them feel safe, to find themselves and be themselves -------without prejudice. I would wager that Michael's grace of spirit will be the one common thread that unites the experience of all of us here tonight. Another quality you will have experienced can be told in a short story --- one his mother already knows I'm about to tell. About 17 years ago, a little boy with a shining mop of curls, entered the office of a rather attractive but much younger blonde woman. He stood quietly at the edge of her desk. She looked up into shining dark eyes and a tentative impish grin. Her gaze travelled down to a pair of dung-green rubber boots with bulging frog eyes. She screeched and screeched at the top of her lungs, feigning revulsion. She looked back up into laughing eyes and in that moment when their gaze met, they recognized the eternal child in each of them, that knows the truth in laughter and the liberation in abandonment to joy. Vesna and Paul thank you for letting me be a small part of your beautiful boys' life. Thank you for all listening and hold him close to light your way. Hey you, Thinking of you so often, and today a little more. Thank you for great memories of times spent together in Switzerland. Wishing we would have had the time to create some more. Michael sat at the front-left (stage right, he would say) of my IB English class in 2001-2002 at UCC. I recall posing questions on Hamlet or the Russian novels we were studying that year. Seconds of silence often followed. And it was often Michael, Jurist to his buddies in uniform, who saved the day, articulating a response that was both personal and universal at the same time. Many times, I had the pleasure of asking Michael for his permission to share something he had written with the rest of the class. His analytical and creative work set the standard, a boon for his peers and his teachers alike. Most of all, I remember what a kind person Michael was. The first word that comes to mind is that he was a gentleman. I was only a first-year teacher at UCC. Yet Michael spoke with me as if I were a headmaster. Some students we never forget. I will never forget Michael, and I was so sad to read about his passing 5 years ago in today's Globe and Mail, July 30, 2012. I thought about you today Mike. Of my fondest memories at UCC, my first interaction with you really stands out. I'll never forget our lunch at Quizno's and ping pong at your house. I was new to the school, and for that matter new to the country. The whole afternoon holds a very special place in my heart. Was buying milk today with Mom and remembered the first time we sent you into the convenience store for milk while we waited outside in the car. You were about 5-6 years old and so proud when you returned and reported how you took a carton from the back of the shelf with a later expiry date. You were always thinking even back then! We were all from Freshman year and spent a lot of time with Mike -- he was a regular on our floor (Reynolds 3) and everyone loved him!" 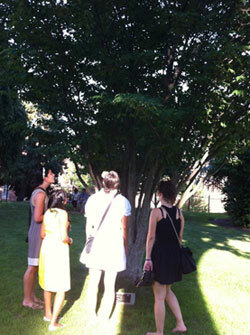 Photo: Former roommates Chiara, Dominique, Kavitha, Whitney and Natalia visited Michael's tree on Georgetown campus in June 2012. Oh Michael, You are missed always, but this time of year seems to trigger more memories. Perhaps it is because of your birthday, or as the days pass, getting closer to July. I remember so clearly five years ago -- I hobbled up with a cane still recovering from my broken ankle to see you and your parents. You and I sat and poured over photos and your stories of your recent family trip to Tuscany and Dubrovnik -- spoke a bit of politics (as ususal) and your plans now that you had just graduated Georgetown. You loved the cufflinks, and it brought pride and tears to my eyes imagining you wearing them in your new NYC business life. It seems just like yesterday --- your light still shines ever so bright and constant. Happy Birthday, Mike! How I wish you were here to celebrate with the famous 'Jurist Shuffle.' I feel so blessed to have had four short years with you, and lucky to have you with me always in spirit. I think of you with every Hoya game, Springstein song, DC trip, unfinished Joe/Tom/Burke/Rose joke (the list goes on...) Words cannot express how much you are missed. Miss you and love you always! While I never met Michael personally I heard many wonderful things about him. Looking through his website can only emphasize the joys and fragility of life. How lucky you are to have these memories my very best wishes. Hard to believe that 27 years have passed since your birth. And, that it’s been five years since you left us. We still vividly remember the summer of ’07 and your excitement in planning the next phase of your life. Graduation was over, your 22nd birthday was spent with good friends traveling the Maritimes, your new “digs” in New York were taking shape, a Fall internship in London with DB was going to kickstart your new professional career. Spending time with family and friends in Toronto, DC, NY and beyond was your summer priority. Hilton Head was your “go to” place to “chill” with Carolina, friends and family. Life was so very, very good. Sadly, you were not given the chance to fulfill all your dreams, or ours. Yet, despite the brevity of your life, you achieved more than most who live multi-decade lifetimes. You gave us 22 beautiful years of joy, laughter and love and tons and tons of memories. ... so many it’s hard to know where to begin and where to stop. Most importantly, you made us very proud of the accomplished and caring adult you had become. Thank you Michael for those wonderful years and so many, many special moments. You are sorely missed, 24/7, and will be forever. Our extended family has had its share of heartbreaks, but none like the loss of Michael. The utter absurdity, the inexplicability of the event that took his life still makes us all shudder and we wonder how this universe can be so irrational and unjust. Still, we keep the memories alive, hoping that somewhere, somehow, Michael knows that we are all there for him. I still recall how we visited with my son, his cousin, when they were small boys. Michael had the most wonderful train set that rain through what seemed the entire basement of their house. Boris, a year and a half old, was so mesmerized that he simply sat and gaped at the train as it whirled around the caverns and sped through the multiple stations. Michael had it all – and yet, he never flaunted his good fortune and even at this young age, he showed such friendship to his cousin that Boris never forgot it. In later years, they played tennis together and while Boris was #1 in Oakville, Michael – a year and half older and so experienced at everything that he touched – really put him to the test on the courts, helping to keep my son humble! Their friendship really blossomed on those courts. When he died, my daughter, Tamara, was so devastated that she decided to change her university program of study, to major in political science, inspired by her cousin. It was a wrong move, of course, but she learned something about herself over the following year at school. She had so wanted to take Michael’s legacy forward in her own way. I am sure that Michael would have told her to follow her own heart, and not simply to try and to move in his path. He was wise that way, even if he would have understood and appreciated her desire to bring him back by following in his academic footsteps. My memories of him are always of an incredibly handsome, brilliant, gifted – and always, so kind-hearted and high-spirited person. The world needed such a man. We all needed him. For now, my hope is that we can all bring some solace to Michael’s parents, Vesna and Paul. There can be no deeper suffering than what they have endured. This website helps us to help them, in our small way, by remembering, by honouring Michael. Of course, we all try to be there for them in every way possible, but we know how difficult it is for them to move through every day, one day at a time. My hope is that Michael is somehow watching, caring, and continuing to love them. As a philosophy professor, I have read and tried to understand why such events occur and I have no answer. The only truth that I know endures beyond death is the love that we feel for those with whom we share our lives, and who we must ultimately lose. That love will always be for me the true meaning of infinity and the eternal. Such love is never lost. I was watching a show on National Geographic last week about a motorcycle journey through Africa (yes, I know you would make fun of me), but it reminded me of our trip to South Africa- in between 3rd and 4th year. It is one of the many fond memories I have- especially given our shared love of travel, and exploring new places. 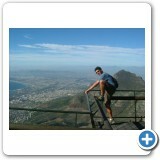 One of my favourite parts of the trip was our climb up Table Mountain. In our infinite wisdom (not! ), we decided to go to downtown Cape Town on one of the mini-busses that pull over to the side of the road- I think there were 18 people in the van at one point, but it only cost 5 cents! Our journey continued with us walking through the bus terminal- two white kids with backpacks on our fronts made us stand out a little, also very smart! 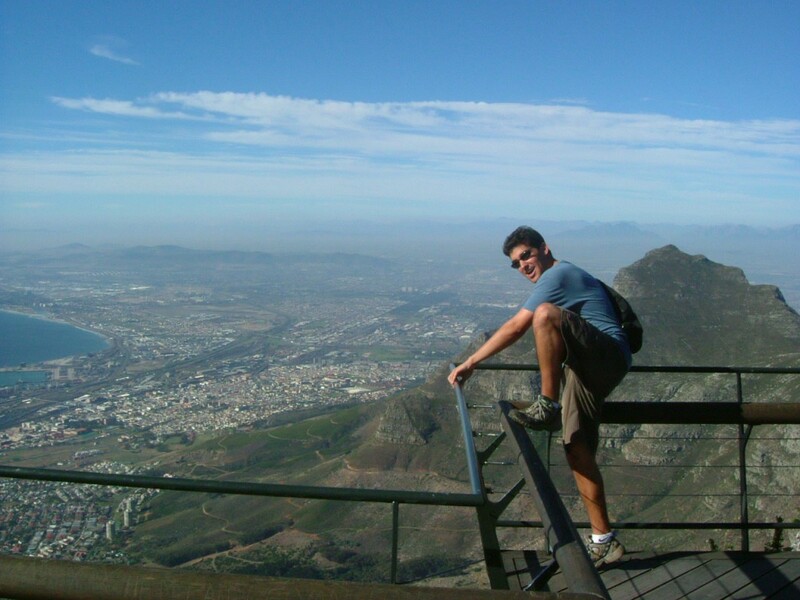 I insisted on bringing the camera, and I am glad I did, as we got some incredible shots at the top- especially the one of you pretending to climb the railing! I was too chicken for that photo and decided on the tamer standard portrait. The way down was a little easier than the massive boulders on the “trail” on the way up, as we took the cable car down. An incredible trip that I am so glad to have shared with you and Morgan. I had the distinct pleasure of getting to know Mike very well during his five years at the Upper School at Upper Canada College (UCC). He came into McHugh's House and absolutely loved it; ultimately being elected the Head of House in his Leaving Class year. Mike was the ideal McHugh's man who competed for the House in sports and cultural events, and defended our honour against all comers. Mike embraced the spirit of our House in that we weren't about "win at all costs" but we were about "participate and include everyone at all costs". Being the Senior House Adviser of McHugh's, Mike and I saw eye to eye as our goal together was to create life long memories for McHugh's men enjoying the UCC experience in every facet of school life. Mike was an outstanding Head of House and likely the best ever in my 23 years as an adviser in McHugh's. As the coach of the varsity tennis team, I got the honour and privilege of watching Mike develop his skills through pure conviction; who else other than a crazy committed kid, would be in a tennis bubble at 6 am several times a week, just doing footwork drills and not hitting tennis balls? Needless to say the hard work continued to pay dividends as Mike developed into a terrific player, our number 1 player in fact and was voted the varsity tennis team captain by his peers. Mike led the UCC Blues in many battles against opponents of all ages and abilities. In our annual trips to Princeton University and The Lawrenceville School, he was our rock who stabilized the players and motivated them to compete to their very best no matter what. Although our victories were few and far between, the boys never gave up and we fought in each every match. Mike's legacy at UCC is a strong one. He has left very large shoes to fill and those who come after him, will venture towards greatness if they follow his blueprint. He was Mr. UCC in many ways. Thanksgiving has just passed, and it was with bitter sweet sadness that I experienced the crystaline blue sky, golden warmth of the sun and turning leaves this past weekend. It was exactly the weather we experienced Thanksgiving 2003, when Michael had a sudden inspiration to visit me in the County that day, urging his parents to make the drive down. We ate out at the County Cider, high on a hill over looking Lake Ontario. It was golden, and a memorie etched both in photos taken that day, and on my internal landscape. MJ skies will always bring you near. We miss you. I didn't know Michael, but I saw his Memorium in the Globe, which led me to this website. He looks like a wonderful person and you are wonderful parents to him. I am so sorry for your loss. My husband and I are regular readers of the Globe and Mail. We were moved when we read the obituary to Michael 4 years ago by the random, sudden nature of his passing and the great loss of promise with the death of a fine young man. We never forgot him. We remembered him especially at this time last year when our only son, John, died at the age of 21 years in a helicopter accident. We share your sorrow. Some people make an impact beyond place and time. Thank you for putting the memorial notice in the paper. My dearest Michael, Reality dictates that four years have passed as of today. One cannot defy reality, it is there, nagging and unrelenting, but the more time, and now years that pass, the greater my disbelief that this is real, and you are not here to bring light, laughter and hope for the years that yawn ahead. I am drawing closer to the end of my journey and could use your grace and wisdom to guide my wee nephews, Matthew Alexander, Adam David and young Jonathon William. That said, I cannot deny, that when at my wits end, and energy drained during their visit all last week, I did feel you intervene and lift us up and be the example they so need and would appreciate. I coached Michael at the Granite Club. He was an absolute joy to have around. He was a quiet leader and I'm not surprised how his life progressed. I'm not surprised at the young man he became. Vesna and Paul....I have tears reading....I can't imagine. I know how you gave him every opportunity and yes....he seized them. RIP Michael. We miss you! I didn't know Michael but my nephew Joseph Zwosta knew him very well. I felt compelled to view this website when he posted it and I must say, it is beautiful. What a wonderful tribute to your son. He was a very special child and his love will live forever in your hearts. My prayers are with you. You made us so proud. You gave our lives such joy and purpose. It is not possible for us to talk about Michael for long before tears arise. Very few parents have produced an offspring who has had such a profound effect on so many who knew him. This is scant consolation for your loss(and ours). He made the world a better place. He will always be a source of pride. Memories of Michael from: Hasan D.
Michael was a truly exceptional young man. He was an intern in my group at Deutsche Bank and I worked closely with him for two months. Every summer since then, I have worked with very bright, smart, hardworking and personable interns but have yet to come across someone who combines intellect with charm, a strong work ethic, and - above all - self confidence and humility like Michael. He is someone I will never forget. Memories of Michael from: Ellen L.
Michael, or Michel as I called him, was a top-notch linguist. A young man of character, all-rounder and a natural leader at the Prep School and beyond. Memories of Michael from: Emma F.
My memories with Michael mainly date back to various pub nights watching the Leafs game or spending New Years Eve at his home with family and friends. He was always very inclusive and treated me as one of the guys! Whenever there's thunder I think of Michael, and I am saddened by thoughts of his family dealing with such immense grief, but then I remember how wonderful he was and I remember that love never dies. I feel my life was blessed by knowing him and I will always remember him as a wonderful person. Memories of Michael from: Jordan R.
I can't remember the exact details regarding when I met Mike at my time at georgetown but I recall it being fairly early on. I do know that I met him through a friend of mine, Ketan, from high school. It was during that early period in college when everyone is meeting all these new people for the first time. No one has established their social circle and everyone is trying to find their way... I just remember Mike striking me as a very sincere, genuine person who was always trying to make sure everyone around him was having as good, if not better of a time as he was. He had an uncanny ability to affect people positively even if he only had a few minutes to do so. He is missed by many. Memories of Michael from: Beatrice L.
To all who were involved in the creation of this site, and to all who are reading this: what a wonderful job you have done; it's perfect. There is so much love and warmth in the content, so much of Mike's accomplishments to celebrate, and so many fond memories and reflections shared by his friends and family to read. In short, this interactive memorial is thoughtful and inspirational, just like the Mike I knew and still miss. Hello to Paul and Vesna and everyone else out there in cyberspace who is reading this and had the pleasure of knowing this truly special, special star. Your light burned bright, but it has not faded. You still shine on in our hearts! Lots of love, my Brother House Head/basketball-loving buddy. P.S. I especially love the photo of little Michael in his BSS uniform and then again in his Stewards jacket. So cute, and so handsome! Memories of Michael from: Clive R.
A total gentleman! Something I remember fondly was when I saw a few guys with Michael...still in his mid teens... just about to enter his house. I said to Michael "Is everything okay?" Michael's reply was "Please don't tell my parents". I agreed providing there was no trouble. While Paul and Vesna were away Michael was having a little party without their knowledege. I kept my word to him until after he had moved on to a better place. Memories of Michael from: Jess C.
Michael was the best kind of person! Whenever there was a nerve-wracking reunion or party where I didn't really know anyone, seeing Michael there would always put me at ease. I wish we all could have had more time with you! Memories of Michael from: Carol S.
A very special young man whom I wish I had had the opportunity to know better and so much longer. Memories of Michael from: Rick C.
It's that time of year when the presidential election is drawing near, and everyone is talking POLITICS. Whenever I hear political debate, I always think of my friend Michael. As many of you know, Michael was fascinated by politics and debate, and he didn't shy away from having his views heard. I consider myself a decent debater, but I was more often than not over my head discussing politics with Michael. He was a voracious reader and he kept detailed track of key emerging issues. His extensive travel experience made him open-minded so he could easily access and understand both sides of any debate. And he spoke with conviction, clarity, and confidence. He was a formidable opponent indeed. But Michael's interest in politics wasn't about shouting louder than the other person or winning arguments. Michael was one of the very few people who really believed in the political process and the power to effect change. I think that is what drew him to spearhead the Lecture Fund Organization, and I think that is what intrigued Michael about one day exploring a career in law. I miss sitting down over a beer (or several) with Michael and hearing what he had to say on the issues of the day. I'd love to hear what he thinks of the issues facing us now. I don't know what exactly he would say, but I know it would be worth hearing. We would be delighted if you share your memories and stories with us via the form below.